This page includes selected articles from the 1995 issues of Across the Fence Post. Last November, Gretel contributed an informative article on how to correctly address an envelope. She's back again to enlighten us, this time about the mechanics of managing a professional mail-bid sale. We welcome this insight into what often goes unknown to the collector-bidder on the other end. The operation of a mail-bid sale requires a fair knowledge of stamps, but more than anything else, it demands the time and patience needed to carefully read and re-search. Too many people neglect to read even the Scott catalog properly. A case in point, most major stamp dealers are still listing unsigned copies of U.S. Scott #RW 1 without gum as "unused," with a $450 catalog value. Apparently, they haven't read the paragraph preceding the Hunting Permit listings in the Scott Specialized Catalogue of United States Stamps. It states that since it was illegal to deface this stamp, all without gum are considered "used." Such errors also occur when the dealer, or collector, doesn't research the entire listing of a stamp type and automatically assumes that the issue on hand is the variety with the highest catalog value. Other errors crop up when the dealer fails to check for removed cancels on stamps, stamps altered to appear as coil issues, and perforated straight edges. These are the problems encountered with United States stamps. When working with foreign stamps, the problems multiply like rabbits. It is not unusual for a country to use the same design type in five or six sets over a 20-year period, with only very slight differences. Stamp catalogs have the information, collectors and dealers have to take the time to read it. A dealer might feel that it is a waste of time to chase down a stamp valued at only 15¢, but the collector wants the proper stamp in the proper position on his album page. With a resolve for patience and research as described above, the dealer must next determine his area of expertise or willingness to acquire the necessary material to develop expertise. Because there's no language barrier, it's probably easiest for dealers in this country to concentrate on United States material. Following that would be Great Britain and the Commonwealth nations. Worldwide or other foreign language areas require detailed research that many dealers seem to ignore. In our experience, the dealer lots and collections we buy invariably have 10 percent to 20 percent of the high-value stamps incorrectly identified. They are usually forgeries or reprints or have the wrong watermark. Postal history, both United States and worldwide, is a specialty that is potentially profitable to an extreme. But, the amount of study, along with research materials, makes it an extremely difficult area in which to develop expertise. It requires a library of reference material to track postal rates, postmarks in all their forms, and post offices, such as dead and railroad post offices. A fair knowledge of history also is essential. It is impossible to list within this article all the literature needed to conduct a mail-bid sale. Briefly, this includes books on forgeries, older auction catalogs by major auction houses, and periodicals published by specialty societies. Often these items are out of print but, depending on the specialty area of the sale, can be acquired from philatelic literature dealers. Absolute necessities are subscriptions to philatelic periodicals and weeklies pertaining to the mail-bid dealer's specialty area. Besides the basic tools like perforation gauges, watermark fluid and ultraviolet lights, the mail-bid dealer obviously needs color gauges for identification purposes. We currently use the Gibbons 200 Stamp Color Key and Michel 400 Color Guide. There is no good color gauge produced in the United States and, ironically, there still is no guide available that depicts all the colors mentioned in the Scott catalog. Magnifying glasses are a must. A 4X hand-held is handiest for a fast sort. Beyond that, we use a 10X, 16X, 30X and 50X. The highest power glasses are generally used when we are looking for cancels that may have been removed from a stamp originally described as "un-used, no gum." They're also helpful for identifying stamps that possibly were purposely scraped in some area to create a variety with a higher catalog value, as well as for sorting early classic European issues. Where does the sale material come from'? Most dealers start a business after years of collecting or accumulating. This original stock, however, will not sustain a business for very long, and it's difficult to locate collections without a storefront or bourse dealings. It's necessary, therefore, to buy job lots from other dealers or so-called wholesale jobbers. The best source is through major auction houses, where there is a wider selection of large lots. Lay to rest the idea that a mail-bid sale can be operated from a kitchen table. The necessity of sorting large volumes of material to create lots requires a fairly large area. Space is even more crucial for the part-time mail-bid dealer. With material that has been roughly sorted and items in various stages of lotting spread all over the place, it's futile to stuff everything in glassines and try to start over the next day or when time becomes available. It's helpful to be able to devote one room exclusively to stamps - even a small room with adequate shelving and a table or two. The ideal situation, of course, is to own a building that has office or store space that can be used for this purpose. Anything smaller than the above is impractical for regularly scheduled sales. Assembling lots is the most time consuming part of a mail-bid sale business. In our case, if it is a single stamp or cover, we try to use enough description to create a picture in the bidder's mind, using photographs for the higher value or unique items. Lots, such as MNH, F-VF, are relatively easy to describe and appraise for value. It's much more difficult when working with used stamps. Is the stamp well centered? What's the density of the cancel? Does it have nibbed, short or clipped pcrfs? What's wrong with the back of the stamp? Are there any tears? Thins? For sets or partial sets, the dealer must discern if the stamps all belong to the same set. Duplication must be considered when creating collections or dealer lots on stock cards. The prospective bidder should be aware of the amount of duplication. If duplication is not too heavy, a collector occasionally will buy the lot and trade off the excess. Dealers bidding in smaller sales generally shy away from lots with too many duplicates. This is normal, because they are bourse, approval, or club dealers, who do not like large inventories of any one stamp. The same applies to mystery lots. If the mystery lot contains numerous common issues or packet materials, this information should be stated within the lot description. Mystery lots can encompass material the dealer has been unable to identify. This will often be the "find" that the mystery lot buyer likes. We never ascribe a value to unidentified material that we add to mystery lots. We want the bidder to feel that the lot was worth what was paid for it. When lotting a large accumulation or collection, there always will be leftover items, and these can be handled in a couple of ways. Some can be used for building collections on stock cards, and some for country lots in packets, each with an estimated value. The most efficient use of leftovers is within mystery lots. Regardless of how carefully lots are described, a few will be returned. How this is handled should be published in the "terms of sale." Most dealers first starting out will get a hold of a half dozen or so other bid-sale catalogs, available through classified advertisements in various stamp magazines. They'll sort through the terms listed in those catalogs and decide which to incorporate in their own sales. A full line of typical office supplies is needed to conduct a mail-bid sale. This includes printed stationery, labels, rubber stamps for various purposes, typewriter and items mentioned in other places in this article. How is the sale catalog produced? Mimeograph and spirit duplicators are a "no-no" and unprofessional. This leaves the choice of owning a photocopier or having the catalog reproduced at a quick-print shop. Neither of these options works well for reproducing photos. A photo-offset printer can be considered. This is the best, but the most expensive way to produce a catalog. The other element of catalog production is time. A quick-print shop normally can reproduce catalog pages while you wait, but will not handle the process of collating and assembling the pages. A full-line, or photo-offset printer, will deliver a finished product, but generally requires a minimum lead time of 10 days to two weeks. To whom are the catalogs mailed? The most potential bidders come through responses to advertisements in philatelic publications. Those who take the time to request a catalog are definitely looking for something to bid on. In this case, advertisements should appear at least a month before the dealer's first mail-bid sale, and then should run continuously. A less effective means of building a mailing list is to purchase names from other philatelic auction businesses. Finally, there's the option of using a mailing list of general collectors, which will reap the least return. Linn's Stamp News estimates that only 25 percent of stamp collectors actively bid in auctions or mail-bid sales. In order to ensure a cash flow for operating expenses, the mail-bid dealer needs to maintain a collection or accumulation of items large enough to fill two sales at any one time. The mailing of the first catalog and postage for shipping after the first closing can exceed several hundred dollars. We find that while one catalog is out, we are working on material for the next sale, and should have material arriving for the subsequent sale. Speaking of closing the sale, lots have to be packaged and sent to the winning bidders. This requires more equipment and supplies. First, is a stock of envelopes and boxes of assorted sizes. All envelopes should have a stiffener so none of the contents is damaged in the mail. Boxes may need filler material, and they definitely need taping with a strong packing tape. Printed labels for boxes and those envelopes that won't fit into a typewriter are handy. To save time at the post office, a scale to weigh the packages and a schedule of postal rates is helpful for calculating the correct postage. The process of awarding lots takes time. For a small sale of several hundred lots, this could be an hour or two. With over 1,000 lots in the sale, it's four to six hours. Next, there's the actual assembling together of the lots won by each individual bidder, typing of invoices, addressing envelopes and packages and answering questions and complaints (hopefully, not many). Some dealers use preprinted invoices where lot numbers won and amount due is added with a typewriter. Then, if, as we do, a list of prices realized is included with the invoice or package, there's another one to three hours in typing time. This is where owning a photocopy machine comes in handy. In our case, with from 160 to 200 winning bidders in an average sale, with two people working, we spend four days on the close. Mail-bid dealers often are asked to accept consignments, for which there should be a set policy of exactly what material will be accepted and under what terms. This means creating an-other document of consignment terms, which include consignment fees or percentages, or any other charges deemed necessary. Other items within the document should spell out how the material will be presented and whether the consignor is estimating value or using catalog value. Unless the sale has no reserves of any kind, the dealer also must determine the consignor's minimum acceptable bid. Most smaller mail-bid houses do not use a formal consignment contract. It often depends upon the amount and value of material being placed on consignment. We operate without a consignment contract. The stamp fraternity seems to be about 99.99 percent honest in their dealings. Our only contracts between us and our consignors has been our word, but it's wise to be protected by certifying or registering any lots being returned to a consignor via the mail if the value is more than you can stand to lose. We've found, too, that insurance purchased through the American Philatelic Society insurance program is more reasonable than U.S. Postal Service insurance. If anyone has any questions regarding the operation of a mail-bid sale, just write to me at: Almajo Stamps, P.O. Box 45, Weyerhaeuser, WI 54895-0045, and I'll be very wordy with my reply. Jim, a retired English and history middle school teacher, has collected stamps since he was a youngster. Hismain interests are United States, Belgium, Germany, Vatican, Rwanda and Ireland issues. His exhibit titled "Ireland - the Overprinted Stamps of Great Britain, 1922-1937" has been in international competition. Jim is a member of numerous specialty societies, including the Eire Philatelic Association. He currently is a WFSC certified judge and serves on the WFSC Judging Committee. "All the world loves a lover," and it usually is the Latin lover that comes to mind when we think about the world's greatest lovers. It was, however, the shy, tongue-tied Irish "lover" who would pick up the practice of issuing Love stamps, following a custom started by the United States. The United States issued its first Love stamp in 1973 and intermittently continues to do so. 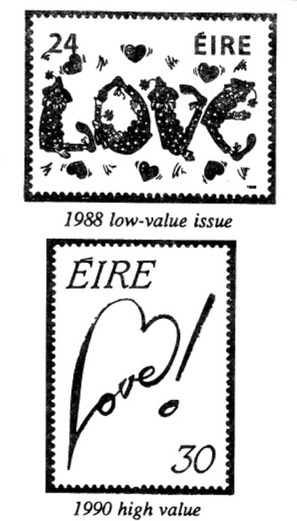 Beginning in 1985, Ireland issued two Love stamps to cover the first-class letter and postcard inland rates. Since that time, Love stamps have been issued every year, usually at the end of January and just in time to be used on the valentines sent to one's favored colleen or laddie. The stamps are always colorful, the subjects serious, comical or whimsical, and always eye-catching. Professional artists usually do the designs of the stamps. 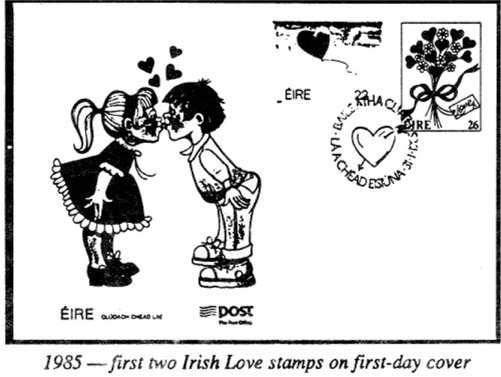 Sometimes, though, the Irish Post Office sponsors a contest for the Love stamp designs, choosing the best treatment of the subject submitted by the general public. - The first 22-pence Irish Love stamp features the word "love," the "L," "V," and "E" written with skywriting smoke, the "O" being a heart-shaped red balloon trailing its strings behind it. The second stamp, the 26-pence first-class letter rate, shows a bouquet of "heart" flowers interspersed with daisies tied with a bow of purple ribbon. A card with "LOVE X" written on it is attached. The 1986 set feature a flying red heart-shaped bird wearing a postman's cap and bearing a letter for delivery to someone's valentine. 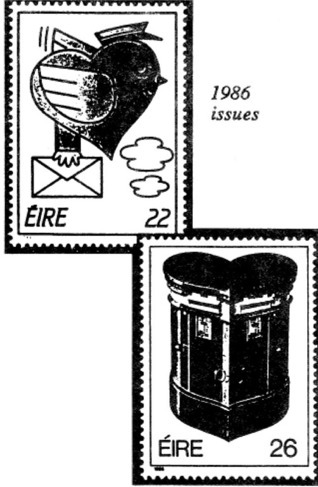 The other stamp illustrates one of the famous Dublin green letterboxes shaped like a heart. chased by a small dog. Various sized hearts flow from the postman's pouch. "Love" in large letters to one side of the stamp features a heart-shaped "O." 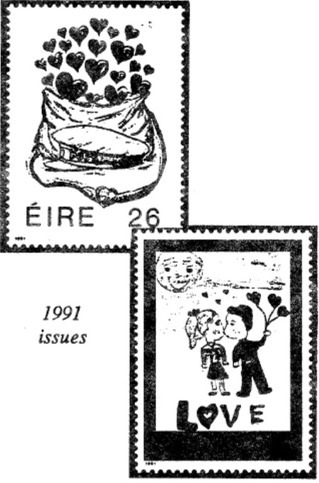 For 1988, the stamps are imaginative as clowns bend and coil to form the word "love," while hearts float about them. The 28-pence again features the upper part of a green post box with hearts and valentines floating from its open slot. 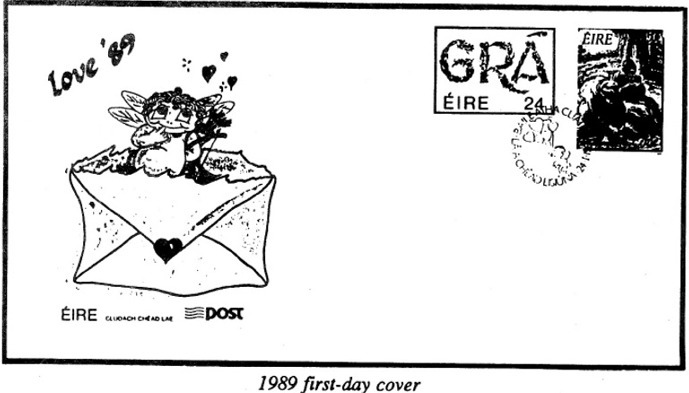 On a more serious note, the 1989 stamps feature a springtime floral arrangement spelling the word "GRA," the Gaelic word for "love." The second stamp reproduces "The Sonnet," an original painting by William Mulready, known to philatelists as the designer of Rowland Hill's first stamped envelope. 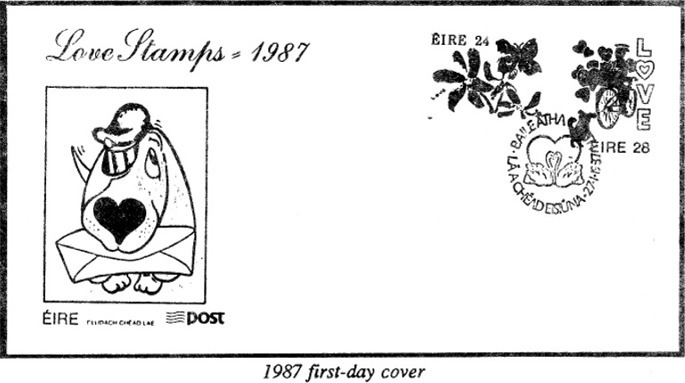 For 1990, the stamps returned to more fanciful designs. 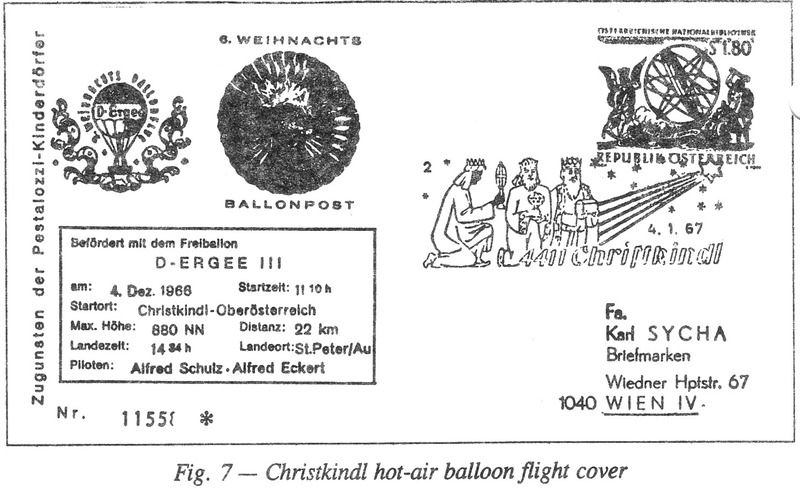 The low value of the series illustrates a heart-shaped hot-air balloon from which postman and post women distribute messages of love. The other stamp is a modernistic heart (a lipstick heart) spelling "love" on one of its sides. A mailbag with hearts floating from it is the theme of the 1991 26-pence value. The 30-pence is a cartoon drawing of a boy and girl kissing while the sun shines down on them, the boy holding a bouquet of heart-shaped flowers. The colorful low value of the 1992 stamp is composed of a montage of concentric hearts with "love" appearing in the upper right corner. The 32-pence has "love" carved in blocks of stone at the bottom of a rainbow. The Queen of Hearts, her gown patterned with hearts, is the inspiration for one of the 1993 stamps. In her hand, she holds a tray from which heart-shaped tarts soar upward. The other stamp depicts a hot-air balloon with a trail of hearts following it. For the ninth issue of Love stamps, Ireland chose a skywriting plane spelling "love" with its smoke. 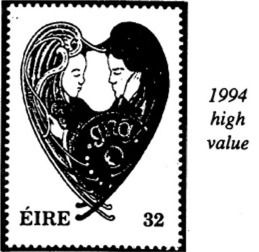 The second stamp features two lovers embracing in a heart-shaped pendant, "GRA" (love) appearing in the design. All of the stamps have had attractive first-day covers and an artistically designed special cancel, usually a pictorial containing hearts, cupids, or the word "love." The Irish Post Office produces first-day covers for all of its new issues and sells them through the An Post Irish Philatelic Service. Dealers also create covers that are available from them at their sales booths at various bourses and stamp shows in Ireland. These covers are usually not easy to find in the United States. When some United States collectors think about expanding their stamp collection, they tend to think of the British Colonies countries as a possible area of interest. These countries, now almost all independent, can be found listed in the first volume of the Scott catalog. Certainly, nations like Canada, Great Britain, Gibraltar, Cyprus, and Hong Kong comprise a rich field of study for a stamp collector weary of his United States collection. In this article, I would like to take you along a less worn philatelic path among the British Colonies, one that offers much of interest at a reasonable price. Have you considered collecting India and its states? If you seek inexpensive and exotic material, few countries offer more to delight and engage the stamp collector. For some of us, the bad news about India is the good news! With a population well in excess of a half billion, there are a lot of Indian stamps in circulation. India has never been the center of attention of stamp speculators, and if your collecting must be done on a shoestring, most of India's stamps - mint, but especially used - catalog less than $1. Admittedly, there is some pricey stuff among the earlier issues, but literally hundreds of stamps can be purchased for Scott's 15¢ minimum. Besides the cost, India issues Indian stamps - no sets of 50 issues commemorating The Three Stooges or Kittycats of the World - the stamps focus on significant Indian h istorical and cultural figures and events. 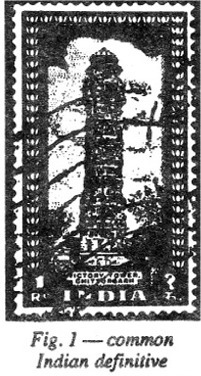 The stamp in Figure 1, for example, shows a common Indian definitive, Scott #218, the Victory Tower, Chittorgarh. Unraveling the mystery of what is commemorated is part of the pleasure of collecting unfamiliar India. But India has much mom of interest to the collector. After the listings for airmails, military stamps, U.N. International Commission stamps, and officials, Scott includes about seven pages of Convention States of the British Empire in India. There are British India stamps from six Indian states: Chamba, Faridkot, Gwalior, Jhind, Nabha, and Patiala, which were o verprinted with the state's name but valid for postage throughout India. Figure, 2 shows one of these British India stamps with a Jind overprint. With the many overprint varieties, identifying these stamps can give the India collector hours of pleasure at a bargain price. Located following the Convention States are 20 pages of Native Feudatory States. These states issued stamps for use in their states alone. Almost all of them differ greatly from the British India stamps, and they vary in quality from lovely line engravings to crudely printed scraps. Figure 3 shows Scott #12 from Sirmoor, located in the Punjab District. 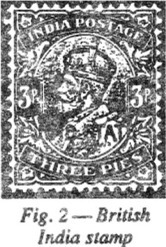 This 6-pies stamp shows a lovely engraved elephant. 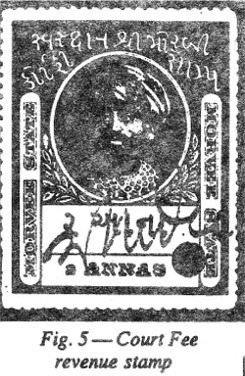 Figure 4 shows a less carefully prepared stamp, this one a 1/2-anna issue (Scott #5) from the central Indian state of Charkhani. If this weren't enough variety, a massive range of Indian revenues were issued by both India and its states. Let me show you two pieces from the Indian states. The first, Figure 5, is a Court Fee _revenue from Marvi, a state located now in Gujarat State. 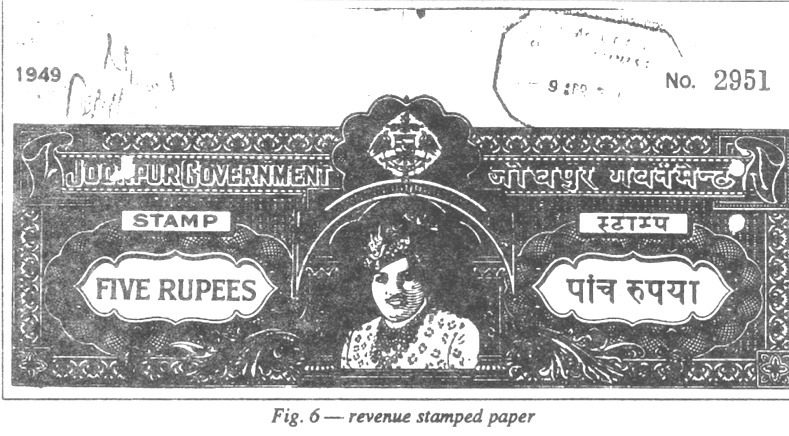 This stamp, issued in 1889, catalogs $2 in Koeppel and Manners' The Court Fee and Revenue Stamps of the Princely States of India, but generally is sold at about 20 percent of catalog value. It is a marvelous engraved stamp. The last stamp, actually a piece of revenue stamped paper, was issued by the state of Jodhpur during the post World War II period (1948-50). Although the piece is listed in Volume 2 of Koeppel and Manners at $35, I bought mine for $3. The revenue is printed on Jodhpur government watermarked paper and looks great in my homemade India album. For its great range of inexpensive and attractive material, I believe India makes a great collecting choice. Consider opening Volume 1 of the Scott catalog and seeing for yourself. I'm sure most of you know that the Experimental Aircraft Association has its annual fly-in/convention in Oshkosh at Whittman Field. This organization has been meeting in Oshkosh since the summer of 1970. The first fly-in attracted about 22,000 visitors. For about the last 10 years, attendance has been between 700,000 and 900,000. It has grown to an international fly-in attracting aviation enthusiasts from all over the world. 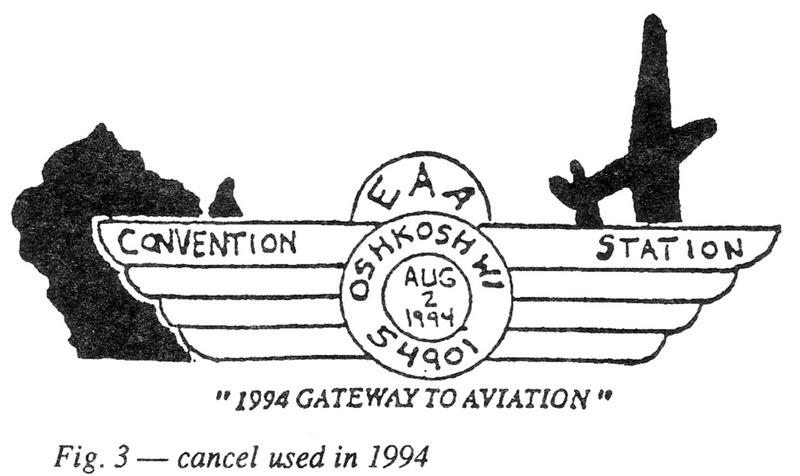 A few years after the EAA moved its annual fly-in to Oshkosh from Rock-ford, IL, the U.S. Postal Service established a temporary convention postal station on the fly-in grounds. In 1979, this temporary station had its own postal cancel (Figure 1). It consisted of a large bulls-eye and four killer bars along with the inscription "EAA Convention Station Oshkosh '79." 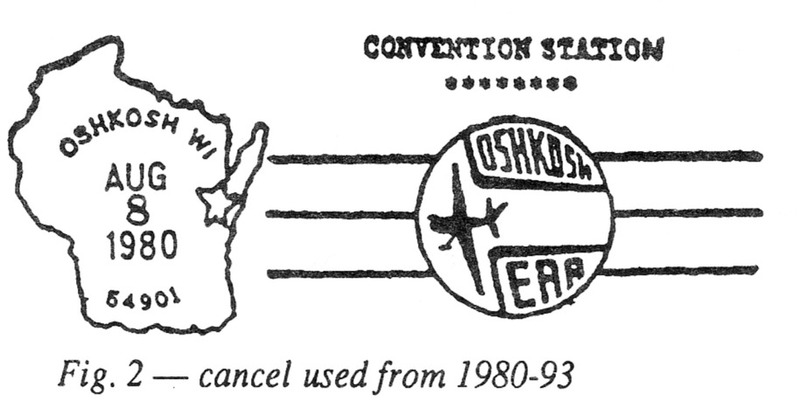 In 1980, the Postal Service supplied the EAA Convention Postal Station with a pictorial cancel that was used from 1980 through 1993 (Figure 2). Because the 14-year-old cancel had worn out, the Postal Service decided to produce a new pictorial cancel for 1994 (Figure 3). It was designed by Denise Cziapinski, who is on the staff o: the Oshkosh Postal Office and also has a flair for art and sketching. Denise appeared at a recent Oshkosh Philatelic Society meeting. At that time, she mentioned that the Postal Service may change its EAA Convention Postal Station cancel design each year, but no firm decision had yet been made. She showed us cancel designs that she had sketched toy possible future use. Collectors wishing to obtain the EAA postal cancel should submit a self-addressed cover franked with the current first-class letter postal rate to: EAA Convention Postal Cancel, Post-master, Oshkosh Post Office, 1025 W. 29th St., Oshkosh, WI 5490I-9998. The cover should be mailed so it arrives some time during the fly-in dates. The EAA fly-in for 1995 will start in the morning of Thursday, July 27 and end the evening of Wednesday, August 2. The cancel date is changed each day. A complete set of canceled covers for the 1995 fly-in, therefore, would consist of seven items. To ensure that your cover does not pick up any additional marks or cancels while en route back to you, supply a large No. 10 SASE with sufficient postage for the return trip. I suggest you additionally en-close clear instructions as to what you want done with your cover. Good luck, and have a successful postmark pursuit. Dr. Hauck, of Somers, WI, is a retired professor of religion from Carthage College. He's a regular contributor to Global Stamp News with his column "Magpie Collector." He writes the "T.O.P.S." (Topics On Postmarks and (meter) Slogans) column in Topical Time and edits the Reply Coupon Collectors newsletter. Dr. Hauck is widely known for his activity in the Collectors of Religion on Stamps, of which he is the president. We're honored to have this contribution to ATFP and look forward to more. In the 1950s I had the good fortune of meeting Leo Gcerth of Postman's Knock (Cincinnati, OH). Leo was one of those dealers who really loved stamps and collected them personally, but he was much more than an accumulator; he was a student of contemporary postal history. He introduced me to reply coupons and postal orders, a challenge with which I have now grappled for almost 50 years. 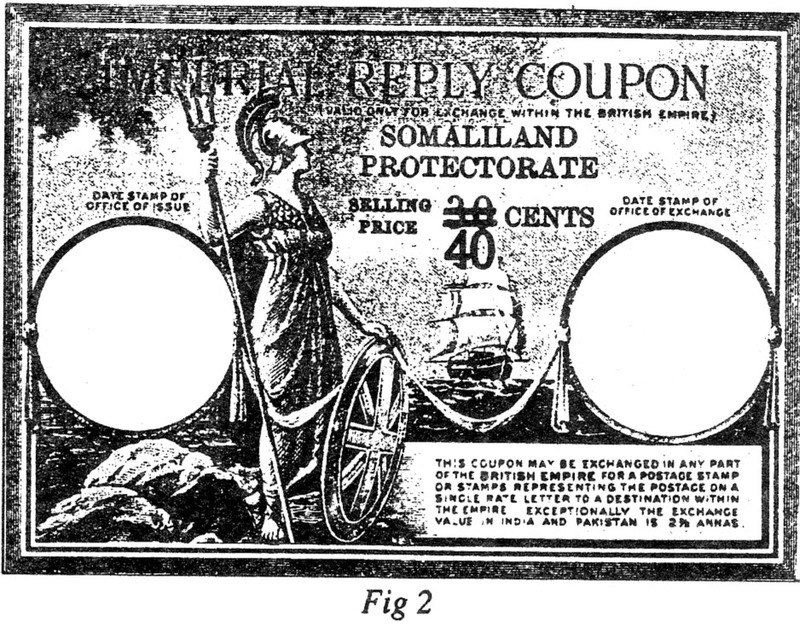 After having discussed for many years various plans to enable correspondents to prepay a reply from abroad, the Universal Postal Union introduced International Reply Coupons on October 1, 1907. They were an instant success! buy an IRC at a United States post office. Over the years, there have been four major designs (and many changes in wording) used for IRCs. 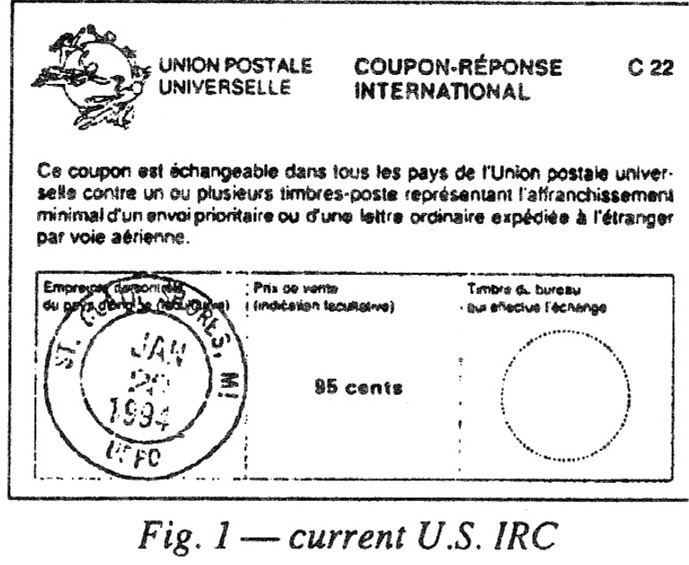 Scott's 1995 Specialized Catalogue of United States Stamps gives an extremely simplified listing of International Reply Coupons issued by the United States on pages 536-37. There are a few country catalogues for IRCs and a newsletter is published annually. In addition to IRCs, which are issued throughout the world under the auspices of the Universal Postal Union in Bern, Switzer-land, a number of regional reply coupons have been issued by some of the world's smaller postal unions. 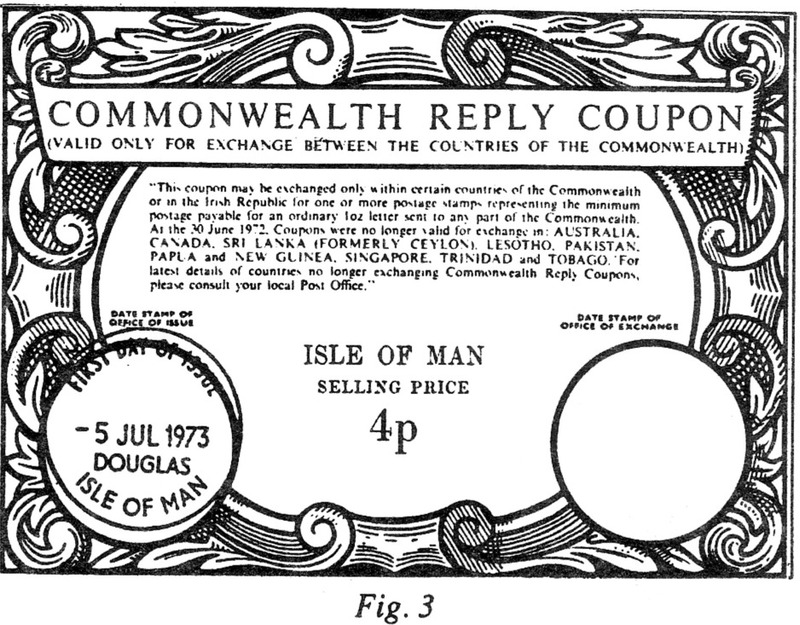 The British Empire issued Imperial Reply Coupons and then Common-wealth Reply Coupons (Figures 2 and 3). 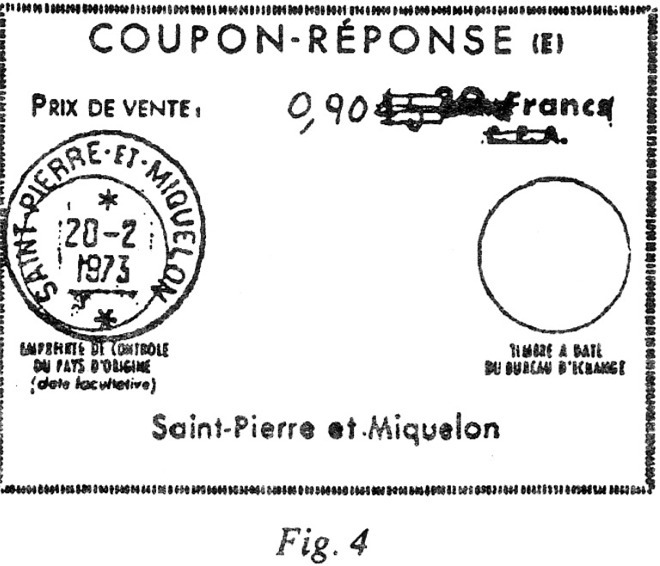 The French Postal Union issued French Colonial Reply Coupons (and now coupons for the outlying departments). (See Figured.) 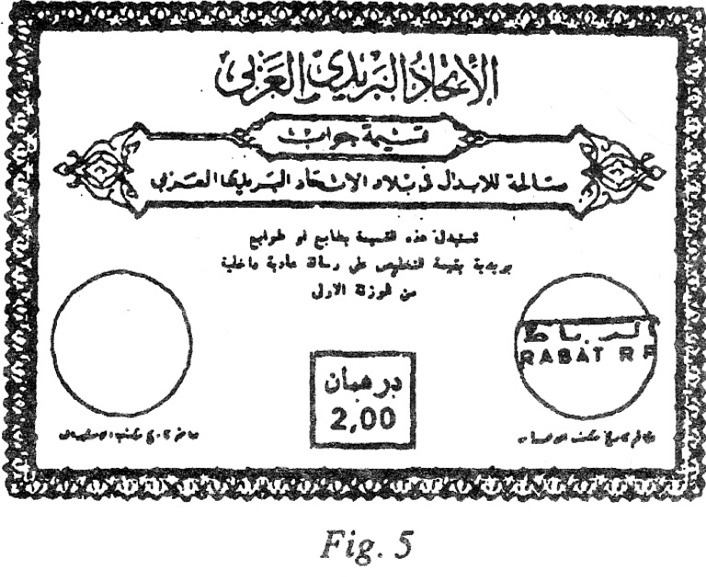 The Arab Postal Union and several other small postal unions have also issued their own reply coupons (Figure 5). the current United States redemption value (presently 50 ¢) for bulk supplies and pays more for older issues or items difficult to find. Whenever I write a dealer, I enclose a mimeographed sheet picturing several reply coupons and postal orders and my offer. Usually, when I am able to attend an area or regional stamp show, I find one or two additions to my collection or trading stock. I often laugh and observe that saving reply coupons enables me to buy whatever I find even though I'm on a restricted budget! In 1975, when I began collecting stamps, I focused my attention on United States, United Nations, and Canada. These were the "hot market" days when virtually every week saw substantial price increases in both classic and recent stamps. Advertisements in Linn's Stamp News touted the investment quality of many countries and urged the smart collector interested in turning a quick profit to buy now. Well, I was caught up in the stamp market frenzy of those days, and during the late 1970s I fixed my attention on the stamps of British Europe, the issues of Great Britain, Isle of Man, Jersey, Guernsey, Ireland, Gibraltar, and Cyprus. In those days, there was great interest in the issues of the Channel Islands, which include the bailiwicks of Guernsey and Jersey, and the semi-autonomous Isle of Man located in the Irish Sea off the Northwestern Coast of England. This was a time when many collectors eagerly gobbled up new issues from these small islands - the populations of each island range from about 50,000 to 75,000. Prices for the attractive recent issues of these countries often rose quickly. Twenty years later, Guernsey, Jersey, and the Isle of Man are not the speculator's dream that they once were. 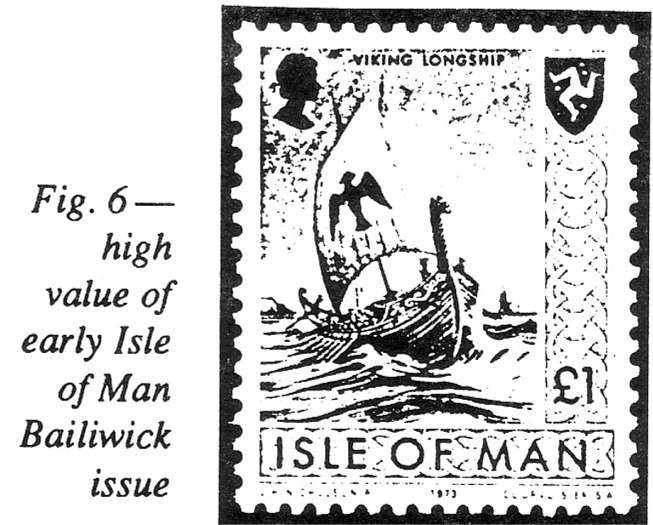 In fact, many of the formerly hot issues have retreated in price, making it possible to build an attractive and reasonably priced collection of these islands for the philatelist on a tight budget. Interestingly, a few issues have actually posted catalog gains. Let's take a look! 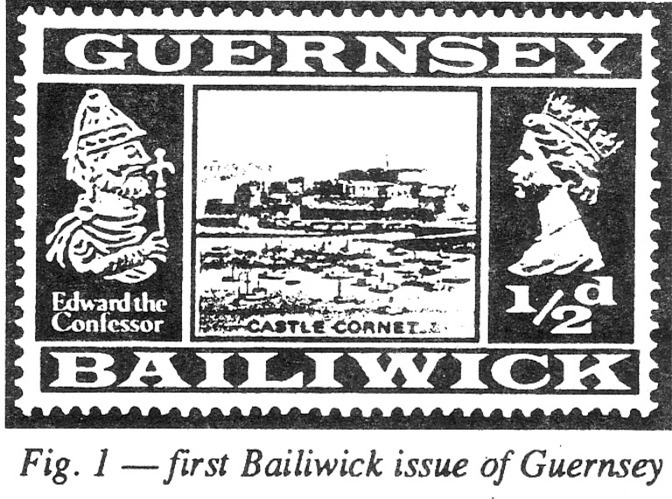 The first Bailiwick issue of Guernsey, Scott #8-23 (Figure 1), a colorful definitive issue, rapidly rose in value in the early 1970's, reaching $83.25 in my old 1981 Scott catalog. Unfortunately, it sold darn close to that price during the market craze. Time has taken its toll, and despite 15 years of inflation - and a more realistic pricing system by Scott - that set currently catalogs at $56.97 in the Scott 1996 Volume 1B and actually sells at a discount from that price. I paid about $25 for mine several years ago. The set that is listed immediately after the first Bailiwick definitive issue, a set of four commemorating Sir Isaac Brock, a Guernsey born military leader who commanded the British garrison at Quebec, suffers the same decline in value. Priced at $9.95 in my old Scott 1981 catalog, the set, #24-27, has been reduced in value to $5.48. 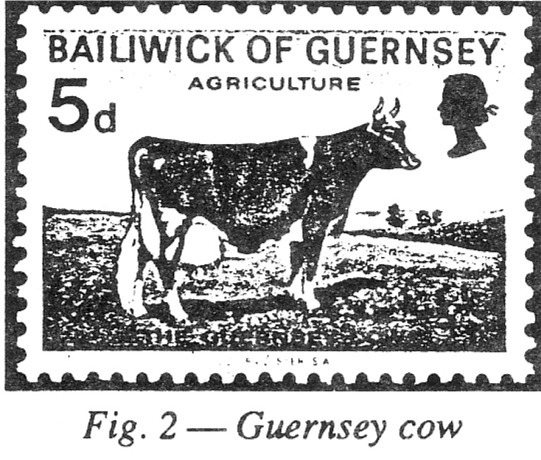 One of my favorite sets, Scott #33-36, featuring on the five-pence value a Guernsey cow, has bucked the trend of these British European issues by gaining in value. The $20.75 1981 Scott catalog value has increased to $32.50, making the set one of the key Guernsey issues (Figure 2). Jersey issues, in many cases, have followed a similar pattern of price decline, making the country a reason-able one for a collector on a tight budget. 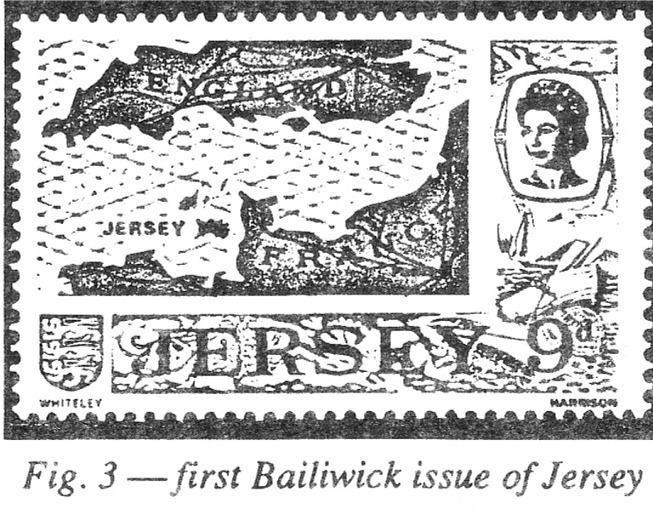 The first Bailiwick issue of Jersey, Scott #7-21, (Figure 3), possesses all the attractiveness that one associates with Elizabethan Commonwealth issues. Issued in October 1969, the set quickly rose in catalog value, reaching $97.85 in my 1981 Scott. Here too, the cost to collectors has dropped. The set currently catalogs at $62.56, a de-cline of roughly 35 percent and can be had at a discount from this price. 1983 - these tiny British European territories have a manageable output. I would guess that over 90 percent of these stamps can be purchased for less than a dollar and some for substantially less than that. If you yearn for inexpensive, attractive, and historically relevant stamps, Guernsey, Jersey, and Isle of Man may be just your cup of tea. 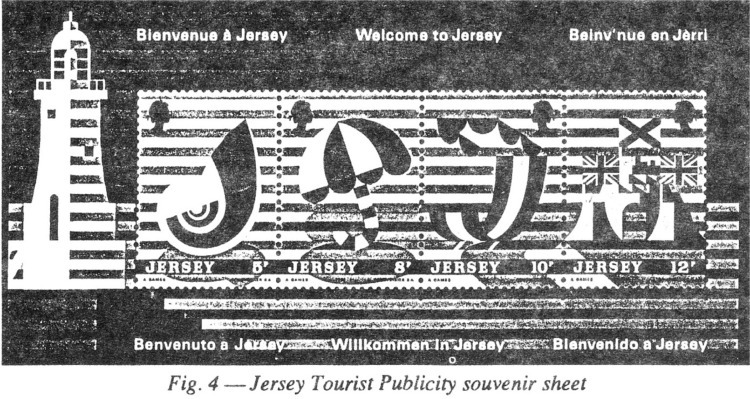 Another Jersey issue, the Tourist Publicity souvenir sheet reinforces the shift in Jersey stamp prices. I bought my copy of Scott #127a (Figure 4) in downtown Milwaukee shortly after it was issued. A notation in the old Scott Volume 1 indicates that I plunked down $1.50 for the stamp, which cataloged $1.85. I should have been more patient. Now, the souvenir sheet is listed at $1. Yet the picture is not one of declines across the board. 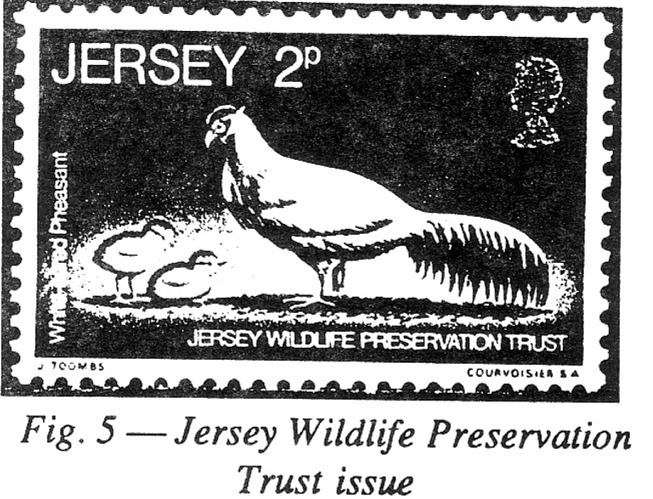 The striking Jersey Wildlife Preservation Trust issue of 1971, Scott #49-52 (Figure 5) has held its value over the past 15 years, moving from $20 to $21.55. That's not high-grade investment performance, but given the sweeping de-clines, it's something. Finally, Isle of Man has much to interest the frugal collector. Its early definitive, the Bailiwick issue Scott #12-27 set, is still a remarkable value after over 20 years. Even with a one-pound value (Figure 6), the set catalogs at $7.25. 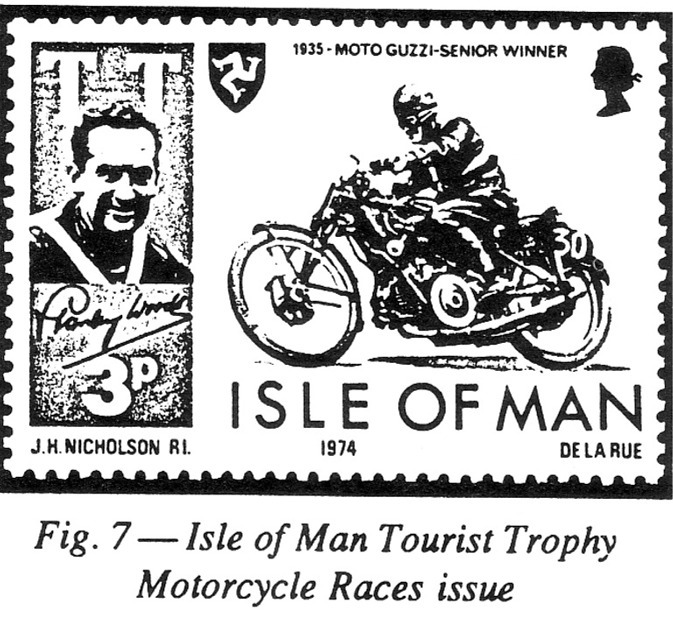 The various commemorative issues focus on local events for the most part, especially motorcycle races like the Manx Grand Prix featured on Scott #33-34 and the Tourist Trophy Motorcycle Races Scott #40-43. The earlier set will set you back less than 50^, while the later one can be purchased from dealers for less than $1 (Figure 7). On July 7, 1934, the U.S. Post Office Department issued a stamp in Green Bay, WI, to commemorate the arrival of the French explorer Jean Nicolet. Nicolet landed on the shores of the Green Bay in an area that is currently called Red Banks. The stamp is Scott Catalog #739. Its color is deep violet, and it was produced with printing plate numbers 21238 and 21245. Victor S. McCloskey Jr. designed the stamp, which features Edwin Willard Deming's painting titled "The Wisconsin Landing of Jean Nicolet." The Post Office Department re-ported that 130,000 first-day covers were canceled for this issue. So-called second-day cancels were applied in - Washington, D.C. It has been said that covers with the second-day cancel are much more scarce than those with the actual first-day cancel. Since the first-day cancels, however, are considerably more popular, the second-days often sell for 50 to 75 percent less the first-days. The Planty Catalog lists 26 different cachets for this issue. I'm sure many ' more have been discovered since 1978, when the catalog was published. The Wisconsin Tercentenary stamp was released during a summer-long celebration in Green Bay, which is considered by most historians to be the oldest continuous settlement in Wisconsin. Green Bay, therefore, was the most fitting site for the stamp's debut. The celebration itself, while considered a financial failure, was a success as a morale booster for the citizens of Green Bay, who were caught up in the midst of the Great Depression. The celebration ended on Labor Day, September 3, 1934, after a visit from then President Franklin D. Roosevelt. Roosevelt presented a speech on Bay Beach (a bayside amusement park just north of Green Bay) about his current political policies. He also gave a well-executed verbal tribute to Jean Nicolet. It is interesting to note that the painting depicted on the Wisconsin Tercentenary issue and its sister stamp, Scott #755, now resides at the State Historical Society of Wisconsin, in Madison. Robert McCormack, an early president of the State Historical Society and an executive of the Weyerhaeuser Company commissioned the painting. Accepting the commission was artist Edwin Willard Deming, noted for his Western and frontier scenes of the late 19th and early 20th centuries. "The Wisconsin Landing of Jean Nicolet" painting was completed in 1904. Deming (1860-1942) also did another painting titled "The Defeat of General Braddock," which additionally resides at the State Historical Society Museum and was commissioned by Robert McCormack. No other Deming paintings are in the museum's collection because shortly after these two commissions were completed, the Weyerhaeuser Company moved most of its operation to the West Coast, taking McCormack with it. Jean Nicolet was an agent of Samuel de Champlain, the commandant of New France (the modern-day Canadian province of Quebec), who was sent, on a mission to find a convenient route to the Orient. This assignment took Nicolet to the shores of Green Bay at Red Banks in 1634. Nicoiet expected to meet an Oriental potentate, thus he is pictured in the Deming painting as wearing an ornate Oriental robe and firing a salute with two pistols. Believing that he had found a new route to the Orient, Nicolet returned to Quebec to report his supposed finding. While on another mission near Silery, Quebec, Nicolet drowned on October 27, 1642, when his canoe overturned in a storm. John Spangler teaches physics at St. Norbert College, in DePere, WI. He has collected stamps since 1944. His interests include United States stamps and postal stationery plus 20th century Chile, Canada, Newfoundland, and New Zealand, all postally used. He has topical collections of physicists and mathematicians on stamps and maps and globes on stamps. John is a member of the American Philatelic Society, Bureau Issues Association, United Postal Stationery Society, and British North American Philatelic Society. He additionally serves as editor of the Green Bay Philatelic Society Newsletter, where portions of this article have appeared. I am a great subscriber. Perhaps that comes from being an academic. I receive more philatelic papers, magazines, newsletters, etc., than I am able to read, but I can't bring myself to stop any of them. I subscribe to the first three. In this article I shall describe some of my impressions from reading philatelic weeklies for a good many years. I do not subscribe to Stamps, but for this article I had six issues from late July 1995 to early September 1995 to review. The weekly philatelic newspapers are valuable for the current advertisements from dealers and publishers and are essential if one has any interest in modern United States issues. There is no other way to keep up with the volume and complexity of current emissions from the U.S. Postal Service. Most of the words printed about new issues from all countries stem directly from press releases by the issuing entity. This is fine for information about the source of the design, the history of the subject being honored, and the instructions for ordering first-day covers. It is inadequate and often misleading if you are interested in the details of stamp manufacturing processes and minor varieties. The marketing and publicity people employed by postal administrations (especially the United States) give no evidence of having more than rudimentary philatelic knowledge. Also, we seldom see reports on the political motivations and machinations that are associated with many issues. Besides United States issues, the weeklies generally have good coverage of the new issues of Canada, Great Britain, and United Nations; good to mediocre coverage of the new issues of parts of Western Europe (Eire, Germany, Scandinavia), Australia and New Zealand; and very spotty coverage of the rest of the world. A similar statement applies to country-oriented (as opposed to topical) feature articles. I collect Chile, and for various reasons I maintain clip-ping files on Argentina, Hungary and the Philippines. It is very seldom that I add anything to these files from the weeklies. The weeklies have regular features on various aspects of stamp collecting and miscellaneous interesting articles on topicals, postal history, stamp shows and exhibitions, etc. Linn's and Stamp Collector have frequently approached the limits of propriety by publishing articles or regular features whose authors have a commercial interest in the topic being discussed. (Every reader of Linn's should be aware that the same company that publishes the Scott catalogs owns it.) This isn't necessarily bad. I want information about areas in which I am interested from people who have the greatest knowledge. I do, however, think the commercial interests of authors should be stated up front in bold print. I shall now make some comments about the individual weeklies. The masthead for the issue of Mekeel's Weekly Stamp News & Market Report I have in front of me says Whole No. 5,463. At one issue per week and 52 weeks per year, this makes the paper over 100 years old. I have subscribed to Mekeel's for 12 or 15 years. It almost died a few years ago, but was purchased and revitalized by John F. Dunn, who serves as editor. This is the smallest of the papers, usually 12 pages a week. This means it has the fewest advertisers and features. Since Dunn took over, though, the quality of the articles has been very good. Linn's going back to 1993.) Mekeel's has complete information on current United States issues that is reliable (not always true for the competition). I look forward to Dunn's well-reasoned and upbeat editorials, though I don't always agree with him. The most useful regular feature is "Mekeel's Reference Manual," a quarter to a half page of significant facts about past United States issues, from classics to fairly recent commemoratives. There seems to be no particular order in the stamps that are featured. Mekeel's subscription rates (U.S. addresses) are $22.50 for one year, $30 for two years. Address: Mekeel's, Box 5050, White Plains, NY 10602. Phone: 1-800-635-3351. As the largest stamp weekly, Linn's has more display ads, more classified ads, and more features than their competitors. To me, the large amount of advertising is what makes it desirable, perhaps essential, to subscribe to Linn's. If you don't see it advertised in Linn's and you get no response from a "Wanted to Buy" ad in Linn's, it probably doesn't exist in the stamp market. I subscribed to Linn's in the 1960's, but I let my subscription lapse because I thought the editor was too often shrill and excitable. I started taking Linn's again several years ago. There have been a number of changes of ownership and editors in the meantime, but it is my impression that Linn's is still the most likely of the stamp weeklies to hype printing freaks as major errors and to get facts wrong. When Linn's reported the perforation variety of the Hank Williams stamp (Scott 112723a), they simply had the perforations wrong. I am not sure they ever published a correction. Linn's has a large number of features that appear regularly (not necessarily every issue) written by authors that range from competent to outstanding. Besides new issues news, I regularly clip and file features on postal history, plate number coils, revenues, forgeries, and meters. I additionally clip the "U.S. Notes" column, by John Hotchner, and the "Trends of Stamp Values." There is also a full page each week written by Steven Rod on the basics of stamp collecting and a "Col-lectors' Forum," where readers can ask or answer questions on all sorts of philatelic and related oddities. Linn's subscription rates (U.S. addresses) are $39 for one year, $69 for two years. Address: Linn's Stamp News, 911 Vandemark Rd., P.O. Box 29, Sidney, OH 45365. Subscriptions can be ordered by phone at 1-800-448-7293. I have been a continuous subscriber to Stamp Collector since I was in high school (that's more than 40 years). At that time, it came out twice a week, and I still find it hard not to refer to it as Western Stamp Collector. Its arrival every week is like a visit from and old and valued friend. It may just be nostalgia, but I think that Wm. W. Wylie was the best editor of a philatelic periodical that I have encountered. The most recent issues of Stamp Collector have 24 pages, including about nine pages of classified ads. Stamp Collector recently went to a smaller page height, about 13.5 inches. Compare this to 13.5 inches for Stamps, 15 inches for Linn's, and 17 inches for Mekeel's. The new page height was editorialized as a modernization, but it has the appearance of simply a cost-cutting move. Stamp Collector seems to be under-going an evolution in articles and features. I think I see a trend to more articles on topicals, current philatelic happenings, and new issue announcements, and fewer items on "serious" collecting. Stamp Collector seems to have more on the subject of computers and philately than the others. Two features that appear every week and that I regularly save are "Brookman Stamp Prices," a serialization of the Brookman Price Guide, published by Brookman Stamp Co.; and Kenneth A. Wood's "This is Philately," a page-by-page serialization of the encyclopedia of the same name. The complete encyclopedia is available from Stamp Collector in three 7-inch by 10-inch hardcover volumes for $59.95. The writing is excellent, and it is probably worth that cost, but something about clip-ping out a page each week appeals to my frugality. The page in front of me is number 709 (I think I have them all), and the series has reached the letter "S" in the alphabet. Stamp Collector has an unfortunate tendency to chop news articles into bits that make them hard to clip and file. Linn's is a little better. They both do better with feature articles. The delivery of Stamp Collector is the most erratic of the weeklies to which I subscribe. Perhaps it is hard for information to pass over the Rockies. Stamp Collector's subscription rates (U.S. addresses) are $19.95 for six months, $34.88 for one year, $59.76 for two years. Address: Stamp Collector, P.O. Box 10, Albany, OR 97321. I remember looking at Stamps from time to time decades ago when it was in a magazine rather than a newspaper format. I had not, however, read it recently until I began preparing to write this article. The issues I read were 24 to 30 pages including about six pages of classified ads. The change in going from Linn's to Stamps is like shifting from a big city daily to a weekly county newspaper. Although there was a full-page "1995 U.S. Stamps & Stationery" list in each issue, it didn't seem that the future of the republic depends on the stamp issues of the Postal Service. United States new issue articles were at a minimum. The editorials were cracker-barrel homilies about philatelic themes. New issues articles covered Guyana, Namibia, Russia, Marshall Islands, Ghana, Gambia, and Netherlands Antilles, among other unlikely places. I think the choices relate to topicals that caught the editor's fancy. Most issues of Stamps had several articles on topicals, a reprint of an article (often postal history) from a decades-past edition of the publication, an article of reminiscences by Herman Herst (interesting, but Herst hasn't been known to let facts get in the way of a good story), and an article by noted dealer Jacques Schiff, Jr., titled "The Error Scene," but dealing with all sorts of things about stamp dealers and stamp values (interesting and useful). For the issues I saw, Stamps seemed to have more news about shows and exhibitions than the others. Stamps' subscription rates (U.S. addresses) are $30 for 60 issues, $55 for 112 issues. Address: Stamps, 85 Canisteo St., Hornell, NY 14843. The best-edited philatelic weekly is Mekeel's. I hope that John Dunn is able to make it go. Dan Hammell has collected Austrian philatelic items for over 35 years. He has exhibited his many other collections at local club shows and at WISCOPEX. Dan is the immediate past president of the Janesville Stamp Club and a member of the Walworth County Stamp Club, Wisconsin Postal History Society, and Rossica Society of Russian Philately. He has written other articles about postal history of the Wisconsin lead region. Christkindl ("Christ Child" in German) is a small village in Upper Austria built around a 16th century pilgrimage church. The Christkindl Post Office is open only during the Christmas season for the purpose of applying special cancellations. The few Christkindl residents receive no mail from this post office but must go to the nearby village of Unterhimmell for postal services. In 1691, Ferdinand Sertl affixed a painting of the Holy Family to a spruce tree in the current Christkindl area. He frequently prayed before the painting in the hope of a cure for his lingering disease. Four years later, the sisters from a convent at Steyr, which is three miles away, gave him a revered small wax model of the Christ Child. Sertl cut a niche in the tree to hold the Christ Child and visited it every Saturday to pray. His faith was rewarded and his disease was cured. The area became a place of pilgrim-age and a chapel was built around the tree in 1697. 1708, and the first Mass in the new church was celebrated on September 29, 1709. The Christkindl Church soon became the destination of a multitude of visitors on pilgrimage to this part of Austria. 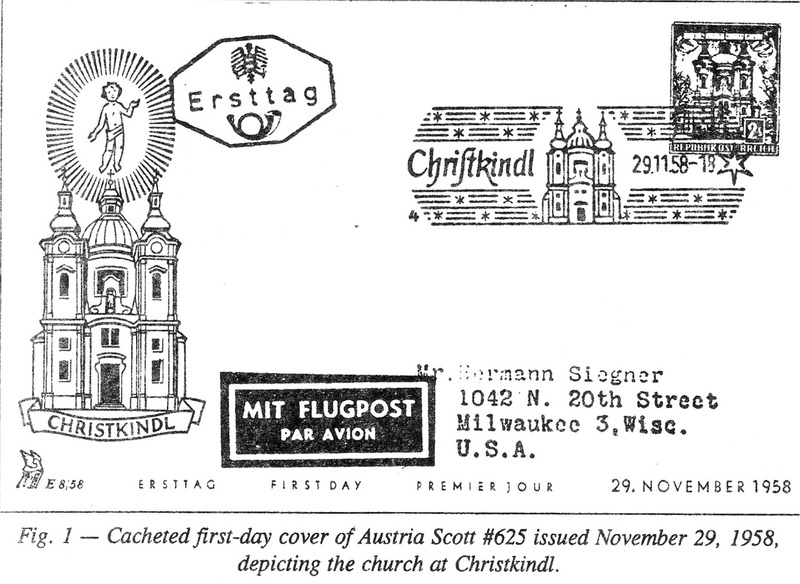 Figure 1 shows a first-day cover of an Austrian stamp that depicts the church at Christkindl. It was issued on November 29, 1958. Austrian children are taught that the Christ Child will bring their gifts to them on Christmas Eve rather than Santa Claus (Saint Nicholas), as is the tradition in other countries. The Austrian children's hopeful letters are, therefore, written to the Christ Child instead of to Santa Claus, whose less important holiday is celebrated on December 6. All letters are answered with a golden leaflet of an angel assuring the children that their letters have been referred to the proper party for receipt of their gifts on Christmas Eve. To handle special Christmas mail, the Austrian Postal Administration decided to open a temporary post office at Cristkindl that would operate each year from early December to January 6, which is Epiphany. Epiphany, the oldest Christian holiday, is also called "Day of the Three Kings" after the three wise men who visited the Christ Child in Bethlehem to give Him their gifts on this day. Epiphany concludes the Christmas season. T he new post office was opened on December 15, 1950, in a small room in the Inn David. Some 42,000 pieces of mail were canceled during this first season. 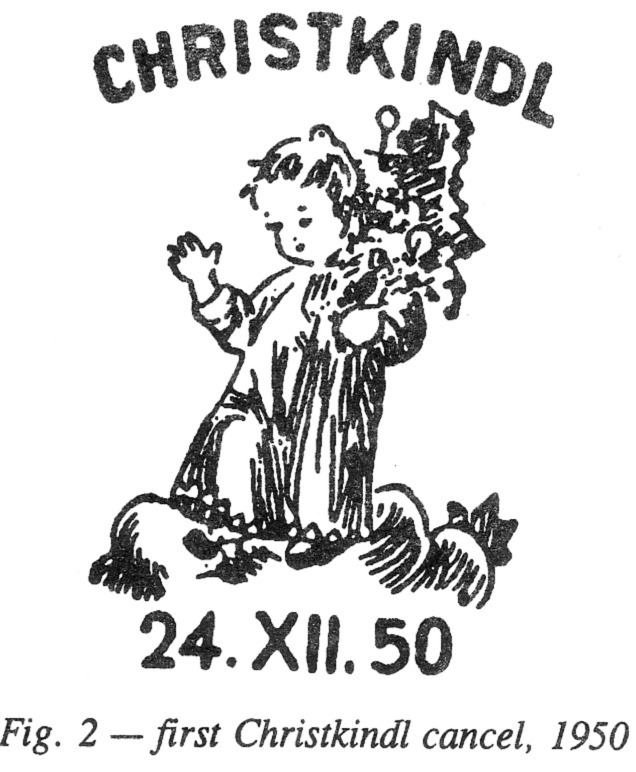 The special bright green cancel shows the Christ Child walking on clouds carrying a Christmas tree (Figure 2). The first temporary post office proved so popular that the operation has been repeated every year since, with over 773,000 pieces of mail handled during the 1960 season and more than 1.5 million pieces in 1970. 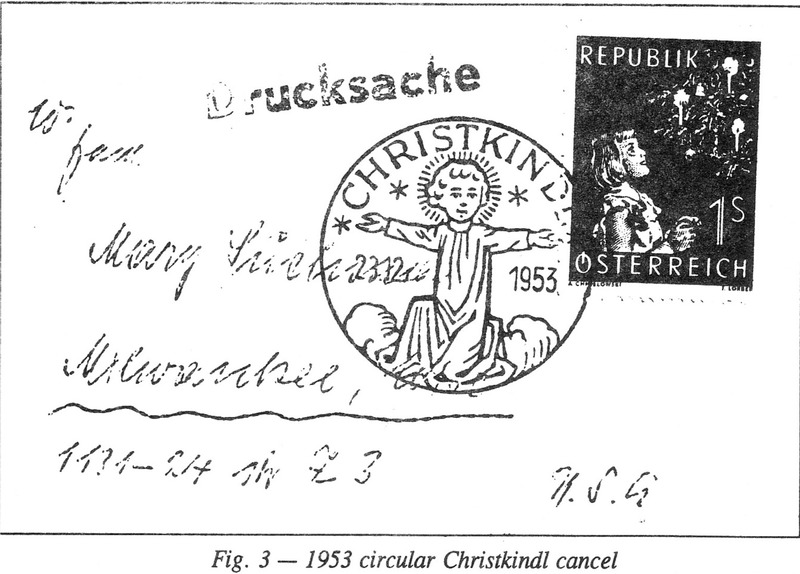 Christkindl cancellations from 1951 to 1957 were circular and featured the Christ Child (Figure 3). In 1958 they became rectangular and included various Christmas themes such as the carol "Silent Night, Holy Night" used for 10th anniversary cancellation of 1959 (Figure 4). 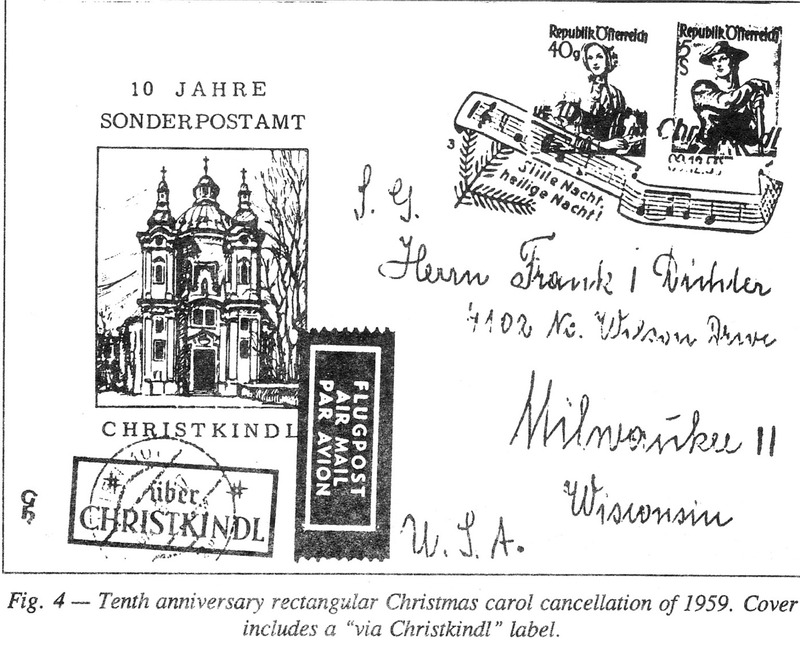 1951, all Christkindl special cancels have been in black ink. 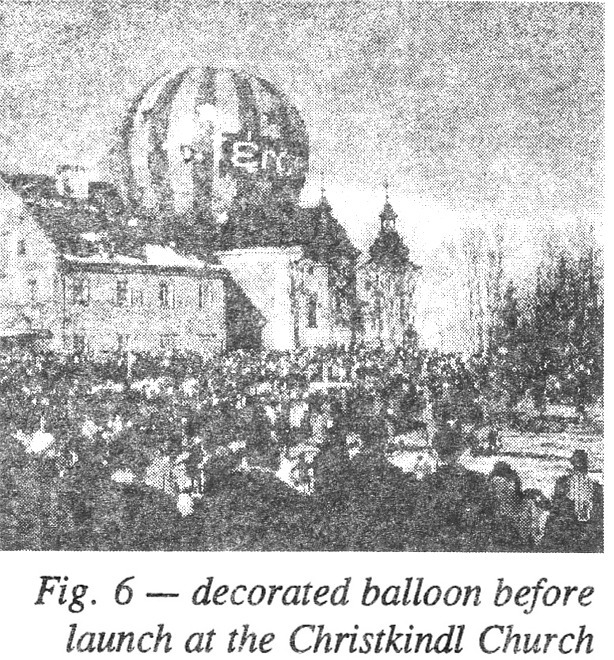 Hot-air balloon flights were initiated in 1961 as a regular feature of the Christmas season. They originate from the Square at Christkindl Church and land in the surrounding area (Figures 6 and 7). All proceeds of the flights go to the Austrian orphan children's villages. To obtain the 1995 Christkindl cancels, send your request to: Post Office, A-4411, Christkindl, AUSTRIA. This year, the first cancel will be available December 1 through December 26. The second cancel will be applied December 27 through January 6. A valid Austrian postage stamp(s) may be provided with your self-ad-dressed envelope and cancel request. When addressing your envelope, make sure there is enough space left for the postage and the commemorative post-mark that measure 25 mm by 63 mm. 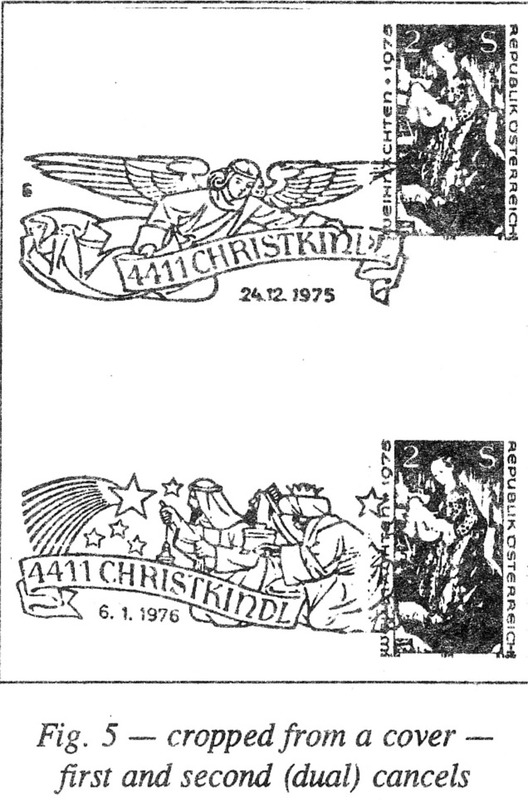 If Austrian postage is not available, you can enclose two International Reply Coupons or $2 in cash, whereby the Austrian Postal Administration will attach the 1995 Austrian Christmas stamp to your cover for cancellation.